Home » News » Silver Fox Ladder Heatshrink: Climbing the ladder to success! Last week has been momentous for our supplier Silver Fox. Their team has been working hard for the past 7 years and they are now ready to present to the rest of the world their innovative new solution, the Silver Fox Ladder Heatshrink!!! Like others within the range, the Legend™ Ladder Heatshrink is manufactured to offer a consistently high-grade heatshrink solution. Legend™ Premium is offered in a 3:1 shrink ratio, meaning that each size covers a wider range of cable diameters. It is also specially designed to have a lower shrink temperature, which in turn saves time when shrinking onto the cable. 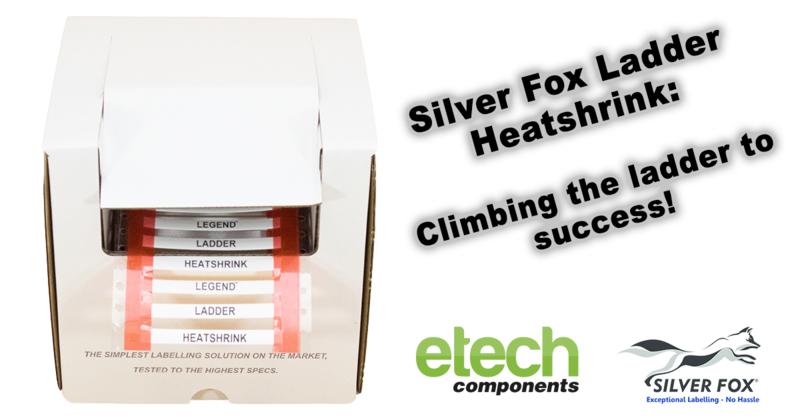 Silver Fox Ladder Heatshrink can also be printed via Fox-in-a-Box®. Still with Silver Fox unique One Software, One Printer and One Ribbon for all of their thermal label range. Silver Fox is an ISO 9001:2008 registered company. The quality, durability and reliability of all labelling solutions is paramount. Unless otherwise stated, all labels are independently tested in approved, external test laboratories in compliance with recognized industry standards.